Ut oh. I told you there would be consequences for last week’s stunt with the blackboard. 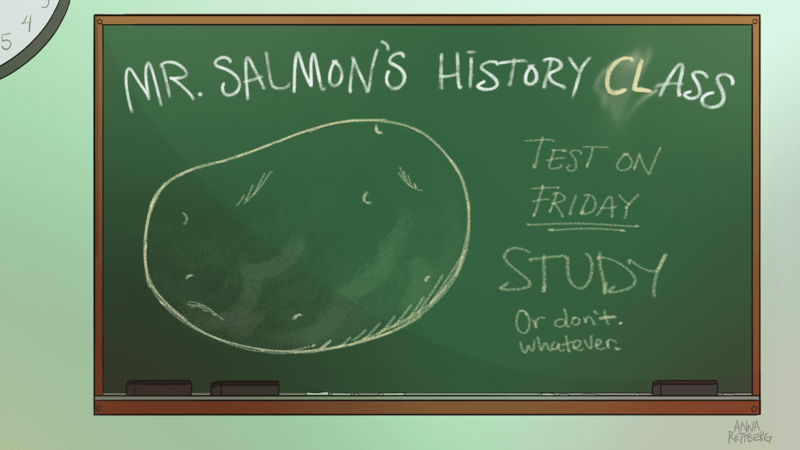 Looks like Mr. Salmon has left us on our own with only a hint as to today’s topic and a promise that we’re going to be tested on it. Lucky for you, I know what Mr. Salmon’s drawing means. So if you want to pass, you’d better pay attention — when Mr. Salmon gets this upset, his tests are usually pretty brutal. The story of New York in 1935 begins a hundred years earlier in Ireland. Now, in case you’re thinking of Ireland as a happy place filled primarily with Leprechauns and whiskey, let me just set the historical tone here: living in Ireland in the mid-1800s was grim. They were occupied by the British, they had no major industry, over half the population lived in single room huts made of mud, and the eighty percent who were Catholic were actively antagonized by the ruling British, who were Protestant. So living in Ireland in the 1840s was bad to begin with. But it was about to get a whole lot worse. In the fall of 1845, the leaves on Irish potato plants beganturning black. Yep, that’s right: it was the onset of the Great Famine. Until the invention of Freedom Fries in the early 21st century, potatoes weren’t a critically important crop for America, or most of Europe for that matter. But for Ireland, potatoes were essential. The British occupation ensured that Ireland’s cattle lands were used primarily to raise beef for consumption back in England. This meant that the Irish themselves had to rely almost entirely on crops that could be grown in large quantities on small plots in less-favorable conditions. Their crop of choice at that time was the Irish Lumper, a variety of potato that grows well in poor-quality garden beds. Being reliant on a single type of plant for a lot of your food means you are uniquely susceptible to blights. Ireland had been “lucky” for several decades that no country-wide problem with their potato crops developed, but in 1845, that luck ran out. A fungus — now believed to have been transported from North America by trans-Atlantic ships — quickly spread across the whole of Ireland and literally decimated their potato harvest for six whole years. To say the least, losing ninety percent of your food supply is devastating. Before the famine was over, an estimated one million Irish died from starvation. That’s in a country of only eight million to begin with. And as if that weren’t bad enough, those who didn’t starve to death were subject to cruel treatment from creditors and landlords. With not even enough food to prevent people from starving to death, there was obviously no food to sell or trade, so the poor Irish farmers found themselves unable to pay critical expenses like rent. Supposedly, when people couldn’t pay rent, one of the things that happened to them in the 1840s is that their landlords straight-up tricked them into getting on a boat bound for North America. Again, I did not try to dig up primary sources for this, since it’s very far removed from the important details for 1935. So I don’t pretend to know authoritatively. But I guess if the landlords didn’t want to try to legally evict someone who wasn’t paying rent, they would buy them passage on a ship and tell them whatever lies they could think of to convince the tenant to go. And the tenants did. So some people fled the famine of their own volition, but apparently large numbers of people were just plain tricked into leaving. And that’s how the first wave of immigration to America began. Packed onto ill-equipped trans-Atlantic ships, the Irish began arriving in North America by the tens of thousands. Some were bound for Montreal, many for Boston, but over two thirds were bound for none other than the Big Apple itself: New York City. When the Irish arrived, they received a traditional New York City welcome — which is to say that they were picked clean by con artists in every way imaginable. People sold them fake railroad tickets, tricked them into paying exorbitant rent, stole their luggage — you name it. But although the Irish were coming from horrible conditions only to find themselves below the bottom rung of society in their new home, things were not to remain bleak forever. With over six hundred thousand Irish eventually coming to settle in New York City by the 1850s, the stage was set for them to become a critical part of New York City’s culture and politics.